How often are prison guards killed transporting prisoners? Eight prisoners and two correctional officers died in an accident near my hometown last week when their bus went off the side of an overpass, onto a moving train. It made national news, and my former coworkers did a great job all day letting people know what was going on as information came out, and putting it all into context by day’s end. When hearing about a fatal train/prison bus collision, many people made the obvious connection, because that’s how we expect things to work, but the culprit seems to be icy conditions and very bad luck. I can’t explain why the eight prisoner deaths seem so much more tragic than the two guards. Some of those inmates who died were clearly not nice people, and wouldn’t have been released for many years. But many were guilty of the regular sort of human failings. The guards had less public faults, and may have been better than average folk. I don’t know. Somehow, dying in the middle of the work you’ve chosen seems routine and, falsely, within your control, so it’s not as poetic. If on the day of our impending death, we were able to wake up with a sense of lusty mortality to pend it some more, we would. We would sit at the traffic light another half second. We’d refuse to come to work that day. But if you’re a prisoner and you wake up with that, you have no choice. Fate brings you places, and in cases like this, it kills you, too. 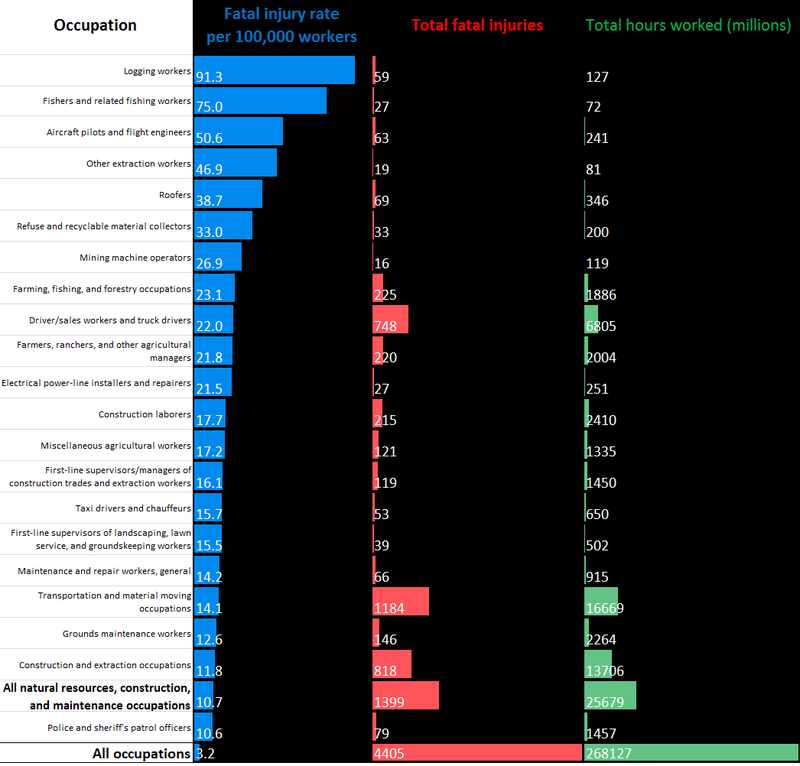 That morning, I didn’t have any sense about myself or people 1,800 miles away, but I was still awake because I’d been looking up the Bureau of Labor Statistics’ most dangerous jobs for 2013, and converting it into a spreadsheet to make some visualizations of the data. Because when I have a spreadsheet open, Excel replaces my need to sleep. The most surprising thing was that working near very heavy stuff and driving are the two most dangerous kinds of jobs you can do. Even if you’re a law enforcement patrol officer, an automatic is more likely to kill you if it can be put in drive than pointed at you. So, I wondered how dangerous correctional officers’ and jailers’ jobs were, and how much prison transport factored in to that. The answer, roughly, is that being a correctional officer is relatively safe and fatal crashes are extremely rare. But the precise answer is tougher to pin down. So we’ve got the number of death listed. Let’s just grab the employment numbers. For correctional officers and jailers, that’s 432,680. Assuming they do work 40 hours per week, that’s easy. But let’s check. Or just being lazy, 6/432,680 – 1.4 per 100,000 workers. Whichever is better, that’s less than half the fatal injury rate for all U.S. jobs in 2013 (3.2 per 100K). In fact, being a cashier is more likely to kill you (1.5 per 100K). Going back a few years, that’s not an aberration for the field, either. Of course, getting good employment numbers for that specific occupation is eluding me now, so let’s just accept that the rate isn’t going to move too much. Notice that although the purpose of those reports is to categorize the fatal injuries into the kind of events they were, many don’t actually add up within their occupation. Why is this? I don’t know. There’s no notes about it in the document I saw, and I haven’t found an explanation outside of it. I really want to call the BLS just to get someone who can explain that to me, but that’s a bridge too far for a blog post as unlikely to be read as this. And unfortunately, I got taken even further down this rabbit hole by a U.S. Department of Justice report. suffered by COs were suicides by self-inflicted gunshot wounds (Konda, 2012). because the BLS only reports suicides that occur in the workplace. So actually, some of the violent deaths don’t involve anyone else. But they should still show up in the individual tallies. In any case, my original question is approximately answered: about two or three correctional officers or jailers die transporting prisoners each year, so Richard Kimble or no, you’re better off transporting prisoners than wares or cab fares. Next Post Who is America’s deadliest Predator Drone pilot?